In 1919 Max Ernst spent a rainy day by the Rhine in Cologne, leafing through the pages of the 1914 Biblioteca Pedagogica . As his eyes skated across its mathematical objects, botanical and zoological images, anatomical and paleontological diagrams, Ernst became aware of an optical excitation: the increasingly hallucinatory sensation of multiple, super-imposed images. He recalled, ‘I formed into dramas my most secret desires, out of what had previously been banal pages of advertising’. Ernst’s spectacular envisioning of early 20th century collage is by no means exclusive to the familiar definition of a cut-and-paste procedure, but an effective tool in recognising the expansive and synthetic vision that he, along with other 20th century artists like Malevich, Picasso and Rauschenberg, would develop as part of the radical autonomy granted by Modernism. So, if one is to take Ernst’s generous lead and see collage not simply as technique but rather as a form that might also encompasses overpainting (Ernst’s early ‘collages’ were, in fact, overpaintings), montage, and the creation of a concrete plane that illustrates the collision between the instinctive imagination and decision-based process, it is then possible to arrive at an understanding of the hybrid and radical forms that have influenced some of the most exciting artists of the past hundred years. 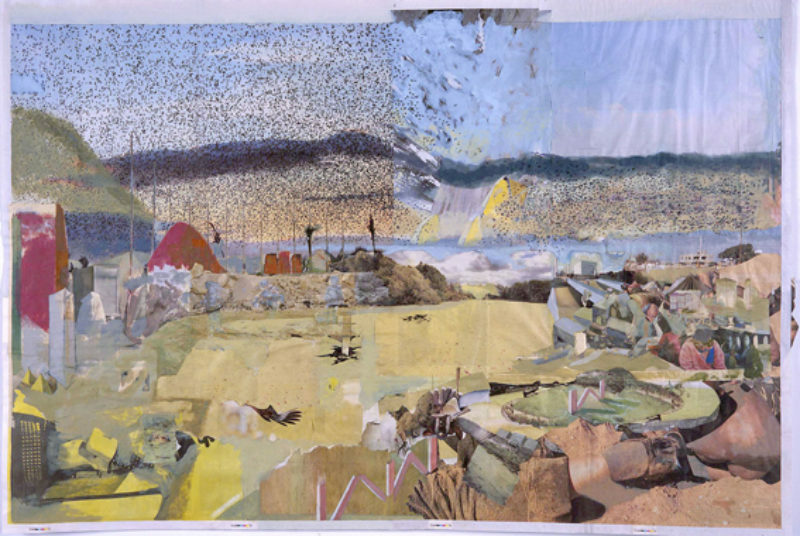 In form alone, there are tempting visual comparisons to be found between these artists and Lisburn-born contemporary artist Tony Swain, whose practice revolves around overpainting straight onto newsprint, and often includes reconfigured fragments of found imagery from newspapers. Yet it is perhaps the notion of process and the creation of an instantaneous drama that are the most compelling connections to Swain’s recent work, where the drama of encountering one of his works for the first time belies the formation and duration of the artist’s process. Although sensitive to being quoted at length, the Glasgow-based artist chooses to keep a distance from both his own authoritative voice and an outside analysis that might try to second-guess such a process. A resident in the city since moving from Liverpool School of Art to Glasgow School of art in 1986, Swain most recently exhibited his work at Scotland’s presentation at this year’s Venice Biennale: a bold, pared-down show of four paintings that demonstrated the dexterity and complexity of the artist’s carefully evolved overpainting and collage practice. Yet, Swain originally spent much of his time composing traditional figurative and still life works in oils. After feeling he might have exhausted the possibilities of his own external and apparently objective ways of seeing, Swain’s dilemma gave way to a different move: a volte face from supposedly objective renderings to an embrace of a highly personalised, intuitive process, articulated in acrylic on newsprint. With a nod to Ernst’s collage books, Picasso’s and Braque’s synthetic Cubism, and Dadaist collage, Swain is certainly attentive to the avant-gardeist history of his painterly surface. But this realisation of newspaper acting as a technical support to his painting began as a chance discovery. Initially mixing paint and testing colours on anything to hand—mostly old scrap newspapers lying in his studios—Swain came upon the potential of newsprint itself. What was the point in transferring this freshly achieved colour from this newspaper here, to that painting over there? Why not transform the mixing palette into the painting’s substratum itself? Here was a device that had a texture, delicacy and detail of its own. And so the newspaper-as-technical-support began to unfold with a myriad of possibilities for the artist to imbricate, erase and extend. In Swain’s bright Glasgow studio, sunlight spills onto stacks of newspapers. Some papers, hoarded for longer, are yellowed, their images bleached over time, while others bear the slogans of nearly new news. Here, Swain locates his starting point for each work, gleaning a singular detail as he leafs through these groaning piles of newspapers. The initial choice might be fairly arbitrary. Rather than informing or shaping the process itself, the image or detail serves to initiate the work. 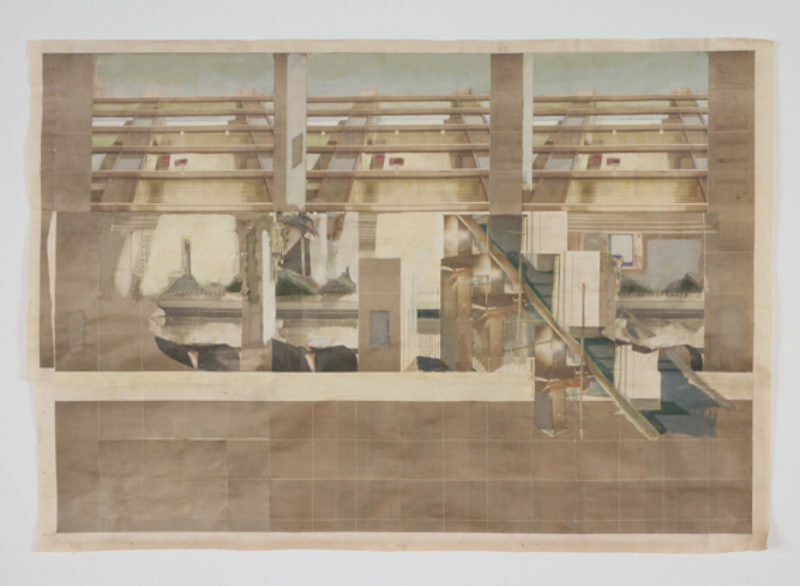 It sparks a sequence of decisions dictated by the area and make-up of the paper, whereby the painting begins to materialise as Swain works from one part of the newsprint to the next. What emerges from this process is a fantastical series of spaces, and these compressed, multiple perspectives seem to abrade each other. The unruly articulation of shapes appears trapped in a dramatically condensed moment—an almost filmic space: filmic because of its incongruous unity and montage, filmic also because a single image might recur like a visual stutter comparable to the appearance of an object repeated through a reel. This kind of repetition has formal concerns, too: in works like ‘Bias Theory’, 2006, the replication of a column detail enacts the again, again, again of the printing press—the persistent reproduction of the machine itself. Swain’s titles, meanwhile, provide the audience with their own starting point from which to enter into the work. Some strike a lyrical tone: ‘Still Travels In Stormtime’, 2005, and ‘Bring Them Together Before They Meet’, 2005; while other more alliterative titles play upon a kind of aural framing device: ‘Compass Concocted Bearings’, 2005, and ‘Stuck Cuts’, 2006. Yet, despite the literalness of these details, Swain’s work tends to defy any recognisable narrative. Neither titles nor images form sequential accounts. The paintings are instead more concerned with posing the challenge of recognition itself, where the attempt to identify forms and shapes is conflicted by the artist’s abstraction. It is as if the miscellany of perspectives begins to prise apart the act of recognition into its two separate elements: seeing and thinking. We see this shape, divorced from its context, resituated in an imaginary space. But the ability to think of the shape, to remember the shape from somewhere before, is beyond the newspaper’s original make-up and beyond rational comprehension. The pictorial depth of Swain’s paintings, too, offer up their own contradictions. Seemingly incompatible perspectives are fused by a shared palette and reconciled by their existence on the single plane. In ‘Sower for More’, 2006, the viewer’s eye is invited into a background sky blue in the top left, but as the gaze drops down it is forced to withdraw to the surface of the newspaper print itself. On the right of the painting the eye might detect a number of other abstracted zones, which too begin to fragment under the searching gaze. However, we begin to see small areas, lines, grids that might serve as a connection point between these otherwise disparate spots. Indeed, the use of the connecting grid is a recurring motif in Swain’s painting, evident in ‘One Hour Pledges’, 2006, where the lines serve to bridge zones that are replicated but also modified with minor distortions. This is not to suggest that Swain’s manipulation of newsprint is loaded with commentary on the state of contemporary affairs. And although it is tempting to read metaphors into the convulsive landscapes depicted in works like ‘Gunfight of the Mind’, 2007, and situate the works in relation to the subject matter that it is painted upon, this is not political critique in any strict sense, although Swain’s painting out of a newspaper’s content—whether it be language or imagery—can perhaps be seen as a political gesture. Yet it’s important to acknowledge how the artist’s newspaper material has been affected by the certain technological conditions through history. 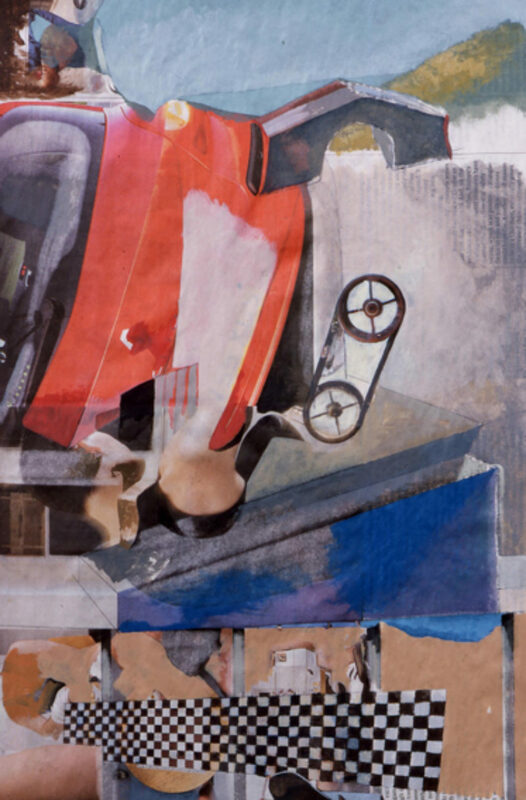 The explicitly political photomontage of the Constructivists, the garrulous anti-rational collages of the Dadaists, and even the early examples of newspapers and newsprint quoted in Cubist paintings and collages, all relied on the very modern ‘now’ of the early twentieth century newspaper. But in this age, Swain’s paintings necessarily acquire a very different historical context than those of his art canon precedents. The fervent celebration of the modern newspaper emerging from the machine press has cooled in the past hundred years. Today’s newspapers (perhaps it is more accurate to call them viewspapers) have acquired a certain yesterday-ness—an obsolescence of informational content coupled with an increasingly outmoded form of dissemination. We live in the twilight of the intended functionality of the newspaper. Consequently, it is perhaps useful to view Swain’s use of material as recuperating a slightly out-of-date, ageing mass culture object. So too must Swain’s revisitation of the collage technique be viewed within a historical frame. Swain’s work, in citing the legacies of Cubism, Surrealism, Dadaism, enacts Marx’s maxim of teaching the petrified forms how to dance by singing them their own song: by replicating and modifying the technique, and utilising a technical support altered by its passage through history, Swain has happened upon a fascinating form of contemporary painting. This is not merely homage to an historicised art technique, but rather a re-envisioning of a process that, both through Swain’s abstracted forms and his imagined content, enacts an optical ‘polyattentiveness’, to use a term coined by John Cage. The proliferation of image, the disconnected and decontextualised zones one glimpses in Swain’s paintings are indeed abstract. And while they are perhaps not so distant from this currently image-fuelled contemporary moment, what these artworks offer is a redemption from the banal imagery of the everyday and a move towards a synthetic imagination.